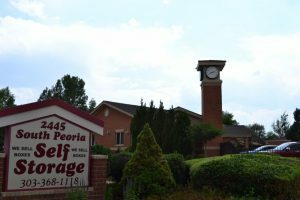 We know you have many choices when it comes to self storage in Aurora. Iliff & Peoria Self Storage will not disappoint! We are locally and family owned. There is no faceless corporation making decisions about the property. The staff is friendly and professional and can help you with everything… from understanding the size of unit you need to suggesting the moving supplies you will require. Our facility is secure! It’s located right on Peoria, it has the latest digital security cameras, it has well lit buildings and driveways, and we have onsite managers. We have an electronically controlled gate that is available 24/7. This 24 access comes at no additional charge and assures you always have convenient access to your belongings. Also, every unit is drive up accessible. There are no elevators or hallways. It’s so convenient to get into your storage that you can think of it as an extension of your garage. Things you can get to whenever you need. Residential and Commercial Storage welcome with No Deposit, and Month-to-Month leases.